Iran will not recognize Israel as a precondition for normalizing relations with Germany, the Islamic Republic’s Foreign Ministry said on Oct. 2. “Ties between Iran and Germany are based on mutual respects and interests, and no precondition would be acceptable in this regard,” Foreign Ministry spokesman Bahram Qasemi, said. German Economy Minister Sigmar Gabriel said in an interview with Der Spiegel that Iran-Germany ties could not move forward unless Teheran recognizes Israel’s right to exist. 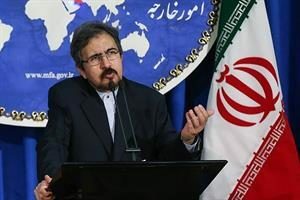 “The Islamic Republic does not allow any country to interfere in its domestic affairs,” Qasemi said in the Foreign Ministry’s response. “Iran considers defending the rights of the people of Palestine as a principle of its foreign policy and will never and under no circumstances will forsake the Palestinian cause,” he added. Gabriel made the same demand during a visit to Iran after the signing after last summer’s nuclear deal. “Questioning [Israel’s] right to existence is something that we Germans cannot accept,” he said.